Unlike Massive Open Online Courses (MOOCs), Small Private Online Courses (SPOCs) aren’t aimed at replicating classroom education, but rather complementing it through blended learning and flipped classrooms. A few years ago Massive Open Online Courses (MOOCs) brought a revolution to education, freeing knowledge from the restrictions of traditional brick-and-mortar classrooms and making it available for free. As a result, millions of people from all over the world have a chance to take professional courses and even get degrees without actually attending universities. But what about on-campus students? Should they take MOOCs, too? The controversy between traditional and online learning seems to be resolved by SPOCs (Small Private Online Courses). As can be understood from its name, a SPOC is provided to a limited number of students and offers tailor-made material. Unlike MOOCs, SPOCs aren’t aimed at replicating classroom education, but rather complementing it through blended learning and flipped classrooms. This way, before setting foot in a real classroom, students already are equipped with the relevant information. Initial research results are showing improved learning, as well as better student outcomes, with this combined approach. 1. Select the audience. This isn’t an issue with MOOCs, but it is with SPOCs. Yet having to select a class roster is rather an advantage than a drawback. “What has become clear is that the engagement you get from a very large group with a wide-ranging set of priorities can be radically different from what you get from a more focused group,” says Professor Robert Lue, chairman of the committee of academics that runs Harvard’s online experiments. Gathering up a group of students who are pursuing the same learning objectives will let you achieve it through a targeted and personalized SPOC. A good way to enroll the right students is to request their academic credentials and base an entrance exam on an open-ended task. That’s what Harvard’s Kennedy School of Government did when it launched a SPOC on U.S. national security strategy. Along with academic credentials, entrants had to submit a written assignment about the U.S. government’s response to the conflict in Syria. It’s no less important to choose the right number of students depending on the teaching capacity, as they will need to attend face-to-face classes, and tightening the seats will guarantee a better follow-up. 2. Choose the course type. In general, SPOC courses can be divided into two types: Self-Paced Online Courses and Directed Courses. The first type lets students enroll at any time of the year and complete the course at a convenient pace within an allotted time. The course takers usually study under the supervision of a certain professor, who provides them with feedback and checks their coursework. Self-Paced Online Courses are great for motivated non-degree-seeking students, who are looking for ways to optimize flexibility without sacrificing faculty guidance. A recent study showed that learners who took Self-Paced Online Courses scored an average 12.65 points higher on exams than students who took it as a conventional online course. Conversely, Directed Online Courses follow the semester calendar and set a corresponding pace. Although they aren’t necessarily required to meet online at the same time, students need to follow a structure set by faculty or instructors, and respect assignment due dates and other deadlines set by the course syllabus. This structure depends largely on the in-class activities and schedule. Students enrolled in Directed Online Courses can earn a degree. 3. Divide activities. 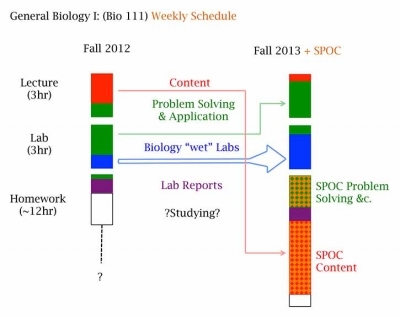 While an independent MOOC unit may take a week, a SPOC unit usually takes a day (similarly to a homework assignment), as much of the material is presented in the class session. This means you will need to divide all the educational activities into those that happen in class and out of it, via an online course. Start by settling the SPOC’s volume. See how much time per week your students are supposed to spend on their home assignments. By restructuring traditional homework into a well-planned online course, you can ensure students make good use of their time. To adapt the huge MOOC content, avoid duplicating what’s been presented in the class sessions. Alternatively, you can give some of the assignments an optional status. This way, students will be able to decide for themselves whether the task is relevant to their needs and level of knowledge. The content of a Self-Paced Online Course is more similar to that of a MOOC. A good idea may be to organize it into a learning path, setting up a criterion students have to meet before moving to the next item. This will allow them to grasp materials gradually and master topics in small steps. More tips are available in the article on do’s and don’ts for MOOCs and SPOCs with best practices from experts in the education and business spheres. The increasing popularity of SPOCs doesn’t mean that they’re pushing out MOOCs—indeed, facts show MOOCs are still a trend. The acronyms themselves indicate that these courses are built for different purposes and audiences: massive vs. small. While MOOCs are still great for off-campus students separated by oceans and continents, on-campus students are lucky to get the best of both traditional and distance learning. You just need to know how to combine them. Dasha Sokolova is an e-Learning content developer who has transformed the teaching experience from a traditional to a virtual classroom. Before becoming an e-Learning specialist, Sokolova worked as an English language teacher for children and adults. She now creates online courses for different types of audiences, including university students who practice blended learning.